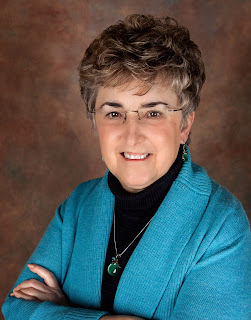 Susan Van Kirk, a Midwest author, just released her second Endurance mystery, Marry in Haste. This follows Three May Keep a Secret (2014) and a novella, The Locket: From the Casebook of TJ Sweeney. I first met Susan in the Guppy Chapter of Sisters in Crime, Inc. where she serves with me as a member of the Steering Committee. I occasionally write while I’m listening to classical music. No lyrics. But more often, I write in complete silence, whether I’m in my home office or the local college library. I’m a 60s junkie, so I can’t listen to that music or I’ll start typing the lyrics in the middle of a description. I just finished Charles Finch’s The Inheritance. I’ve read his entire Charles Lenox series, and I am captivated by his aristocratic detective and his setting of mid-19th century London. He does such a wonderful job of adding detail from that time, and after reading this novel, I now know why the British drive on the left side of the rode and why Americans drive on the right. If you want the answer, you’ll have to read his book. I’m a plotter. The connection between teaching and writing is very strong in my life. The overview of a teaching unit is like the early stages of a book when I’m thinking about the idea and how to execute it. Unit planning in teaching is like chapter planning in writing. Lesson objectives in teaching mirror objectives for each chapter of writing. When I taught, I was constantly adjusting content and techniques for changes in my situation, and I do the same when writing. My teaching methods grew out of my need for structure to contain the chaos and teach material, and my writing methods are all about taming the ideas and fitting the pieces together. The characters are my focus, and if I can’t get involved with the characters, I’m out of there. I need to have that emotional connection. Oftentimes, when I read a book with literally no characters that I like (think Gone, Girl), I just have a hard time staying with it. I need someone who touches me as a human, and a book without humanity is one that I don’t finish. I do read reviews of my books when I happen to see them. They help me understand what readers notice, comment on, and like or dislike. An occasional bad review doesn’t bother me because I understand how subjective reading is. Publishers read reviews, so it makes sense to have some idea of what they’re talking about when they ask you about your reviews. My copyeditor undoubtedly pulls her hair out if I drop backstory too early and for too long. I have become much better about that, but I’m sure when I first started out, she lost a lot of hair. 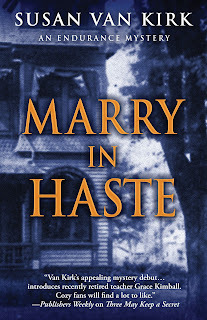 My most recent work, Marry in Haste, is about two marriages, one in 1893 and one in 2012. Both involve murders, and both have a dark secret: they are abusive relationships. I wanted to find out more about this topic—the psychology of it as well as its relationship to PTSD—because people I have known and loved have found themselves in such relationships. I needed to know more about why this happens, how abusers isolate their victims, why victims stay, how laws have changed or not, how courts have changed in their treatment of victims and abusers, and how abuse affects someone psychologically. Since the large percentage of victims are women, my victims mirror that statistic. At the same time, I wanted to create a setting that would continue in my series, and a grand old Victorian home I used to live in became that setting. 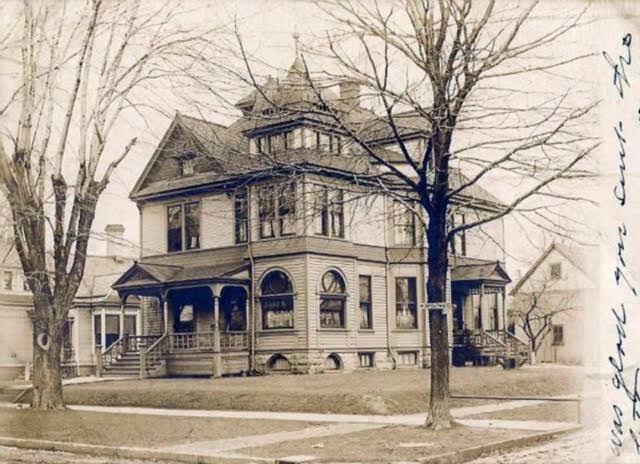 It had over 4,000 square feet of living space, and researching its past and how to renovate it became an interesting part of my story. The use of “fun” as an adjective grates on me. “Fun” is a noun. We are going on a trip to have fun. It bothers me when people say or write, “We had a fun time.” I have never thought of that word as an adjective, never used it that way, and it bothers me when others do. Each time I finish my writing for the day, I make a list of where I am going to start tomorrow and what ideas will jog my memory for the next day’s writing. It is 2012 in the small town of Endurance, and wealthy banker, Conrad Folger, is murdered and his wife, Emily, arrested. Emily Folger was one of Grace Kimball’s students in the past, and Grace knows Emily could never murder anyone. So, Grace joins Detective TJ Sweeney to investigate the murder, and they uncover a dark secret. In 1893, Olivia Havelock, age seventeen, moves to Endurance to seek a husband. She finds one in Charles Lockwood, powerful and wealthy judge, but her diary reveals a terrifying story. Two wives—two murders a century apart—and a shocking secret connects them. Marry in Haste is a story of the resilience of women, both in the past and the present. What a "fun" post, Susan! The plot sounds intricate and interesting. All the best with it. A lovely interview, Susan and Jim. Susan did the hard part -- all I did was ask questions and a bit of formatting! Thanks for having me on your website today, Jim. I enjoyed answering your questions....not like your typical interview. And thanks, Vicki, for stopping in.